20°C, building breeze, full sun. Duke of Edinburgh practice expedition. There were groups this year, and a chance to use the recent training. First day was an 8 mile walk. As always, the kids’ stamina was a serious limitation, though this year, the kids seemed younger. Their fitness remains almost as low as possible, their resilience was equally weak. However, at least I enjoyed myself. The weather was perfect and early summer was in full glory. 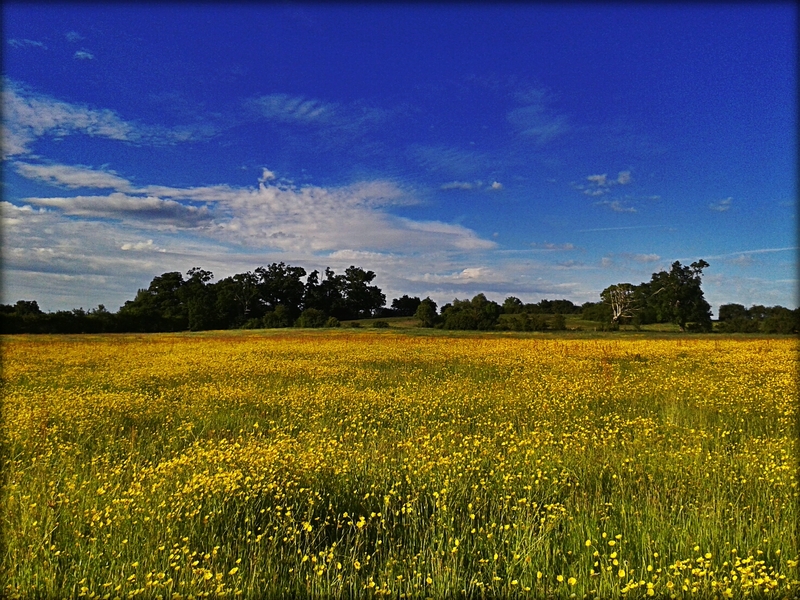 Fields were ablaze with buttercups and all the other summer meadow flowers. Kids frequently asked how far is it now. My answer was always look at the map and you can tell me! One persisted, add said “why don’t you just tell us?”. Because I will not do your thinking for you. I got home very tired. Although it was only one night, I had no control over sleeping times. I bedded down after 11pm, but got up at the normal time. Over the years, I have tried to crystallise my thoughts about the relationship between tiredness and perception. Hiking is a rich aesthetic experience, all the senses, are invoked. Internally, I can almost feel my mind draining of the detritus it collects while at work. There, I am surrounded by voices and commotion of dozens of children at once. I need time to clear all that bilge from my head. On the other hand, in pours the experience of being out there. That experience is altered by the building physical exhaustion of walking. For most of the daylight hours, I walk and walk. Consider the way you listen to music on those occasions when you are half asleep. Teetering on the edge of sleep or even dipping in and out, you can still follow the soundscape. A rare state of mind. Camping near a babbling stream is soothing. As you fall asleep, there is a time when your mind switches off your ears. Sometimes it switches back several times, an effect that can catch your attention. Peaceful. This entry was posted in Hiking, Hill & Moorland, Work and tagged Duke of Edinburgh, leading, Walking, Worcestershire. Bookmark the permalink.